On February 1, 2015, Ms. Dubé was appointed by the Governor General in Council as Chief Executive Officer of the newly created Crown corporation, The Federal Bridge Corporation Limited for a term of four years. She was CEO of the legacy Federal Bridge Corporation Limited (FBCL) from March 31, 2008, to amalgamation at pleasure for a term of five years, then extended for a subsequent term of two years. She is a Senior Executive with over 39 years of significant experience in leading change and in managing programs and operations in a Crown corporation environment. The FBCL is a federal Crown corporation resulting from the amalgamation of three federal Crown corporations, responsible for the Canadian interest in international bridges located at four crossings between the Province of Ontario and the States of New York and Michigan: namely in Sault Ste. Marie, Point Edward, Lansdowne and Cornwall. These structures play a vital role in connecting Canada’s transportation and economic network with the world. This important asset portfolio is managed directly or through FBCL’s wholly-owned subsidiary: The Seaway International Bridge Corporation, Ltd. The FBCL is also responsible for the management of international agreements with its US partners: The Thousand Islands Bridge Authority, the St. Lawrence Seaway Development Corporation and the Michigan Department of Transportation, on behalf of Canada. The FBCL is a parent Crown corporation that reports to the Parliament of Canada through the Minister of Transport. As part of her responsibilities, Ms. Dubé is a member of the FBCL Board of Directors and the President (Chairperson) of the Seaway International Bridge Corporation and the Sault Ste. Marie Bridge Authority; She is also a Board member of the Thousand Islands Bridge Authority. She represents owner interests at joint Canada-US bridge management meetings. Before that, Ms. Dubé had been appointed by the Governor in Council as the Chief Executive Officer of the National Capital Commission (NCC) to hold office during pleasure, on April 4, 2007. With the NCC since 1982, she had held positions of increasing responsibility. Prior to being appointed as CEO, she held the position of Executive Vice-President and Chief Operating Officer, to which she had been appointed on February 14, 2005. Prior to joining the NCC, Ms. Dubé was a senior auditor with the Office of Auditor General of Canada. 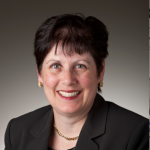 A commerce graduate from the University of Ottawa, she became a Certified Management Accountant (CMA) now known as Chartered Professional Accountant (CPA) in 1982. In October 2004, she was designated Fellow of the Society of Management Accountants (FCMA), a prestigious, national honorary designation recognizing CMAs who, by their achievements, bring distinction to the profession and serve as role models for others. An FCMA designation demonstrates excellence in management accounting, commitment to CMA Canada and civic-mindedness. This designation is now known as Fellow Chartered Professional Accountant or FCPA. Ms. Dubé is a member of the Heads of Federal Agencies Executive Committee. She has also participated in the organization of fund raising activities and other events as board member for various volunteer groups. Ms. Dubé lives in Ottawa, Ontario with her husband, Frank Chiarello and their children, Francine, a teacher at the Centre-East French Catholic School Board, and Bruno, who is pursuing his studies in business and commerce at the University of Ottawa. She has a passion for family, music and travel.